The Philippines cheered when Catriona Gray took the crown home yesterday at the Miss Universe pageant in Bangkok. From her Mak Tumang dress inspired by the Mayon Volcano and stunning Tessera Jewelry cuff earrings, every detail of her look was perfectly crafted to represent the Philippines. One question in my mind remains, however: what is that stunning red lipstick she wore to the finals? We asked her makeup artist Jelly Eugenio but we are still waiting for his reply. From the photos, Catriona has a bright, fiery matte red lipstick. 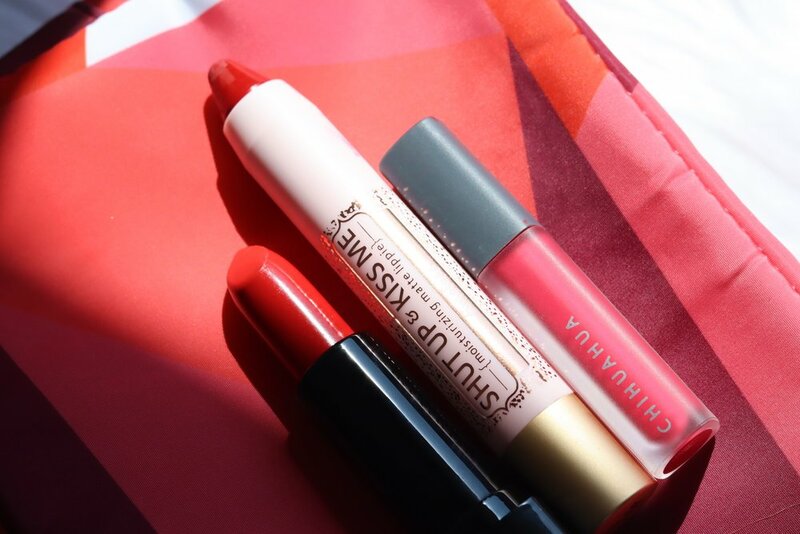 Allow us to present six red lipsticks from local brands that we think might just fit the bill! FS Cosmetics Filipinana Lipstick in Darna (P299 from BeautyMNL.com). Darna is a strong female character that is best known for her bright red costume. This matte red lipstick is a true red that will flatter our warm Filipina skin tone. Happy Skin Shut Up & Kiss Me Lipstick in Timeless (P649 from Happyskincosmetics.com). This is a new red lipstick as featured in Happy Skin’s 2019 holiday collection. It’s a deep red with pink undertones that can draw eyes in a room! Chihuahua Mini Liquid Lipstick in Marilyn (P159 from Chihuahua’s Shopee store). Chihuahua Cosmetics is a local brand that’s all about mini-sized makeup that you pay less for, rather than full-sized products which we never seem to finish. Their Mini Liquid Lipstick is their latest product - right now it’s only available in Shopee before rolling out to their mall kiosks! Marilyn is a bright red-pink reminiscent of some of the screen siren’s favorite lipsticks. Ellana Liquid Matte Lipstick in Love Is Pure (P499 from Ellanacosmetics.com). This is a rose red that is more wearable for everyday. It’s less bright than the others in this list, so if you’re not yet sure about going all-out lava red, this is a great option! Colourette Kolorete in Kilig (P499 from Colourette’s Shopee store). Kilig is a burnt sienna red that I’d also recommend as an everyday color. This also has a more blendable formulation, so you can use it on your cheeks and eyes, as well. Ever Bilena Liquid Lipstick in Thalia (P185 in stores). I’d say that this is the closest color to the one Catriona is wearing on her lips. She’s an Ever Bilena endorser, after all! I personally like this formula too because it feels more like melted bullet lipstick rather than the typical liquid lipstick formula. What is your favorite Miss Universe-worthy red lipstick? Any guesses on what Catriona Gray is wearing when she was crowned? Sound off in the comments below!